The police of Chittoor, Nellore and the bordering districts of Tamil Nadu are mulling various options to nab the notorious Parthi Gangs from Maharashtra and Madhya Pradesh, which have reportedly been on the prowl in some vulnerable places close to the railway and bus stations in search of potential targets. Deputy SP (Crime) I. Ramakrishna in Chittoor told The Hindu that the police had received information that the Parthi Gangs, known for their ruthless dacoities, were moving in Chittoor, Nellore and some bordering districts in Tamil Nadu. It is suspected that more than 15 gangs, comprising 12 to 15 members each, might be active.The gangs members hailing from Chatri, Parbhani, Nasik, Engine Ghat, Gulbarga, Mumbai, Aurangabad in Maharasthra, and from Bhopal in Madhya Pradesh would keep moving from State to State. They would act as daily wagers, rag pickers and beggars in the day to identify isolated houses for housebreaks in the night. According to police, the gangs would strike the target in big groups, ransacking houses and making good with valuables. Even simple resistance from the residents would prove fatal. The gang would not hesitate to attacking women, elderly persons and children fatally, with iron rods and sticks. After committing the crimes, the gangs would escape by trains or buses.For the convenience of their operations, the gangs would prefer making temporary shelters close to railway stations, flyovers connecting the highways. Women members in the gangs would play a vital role in watching the movements of the police and guiding their colleagues. The district police have engaged special parties to intensify night patrolling on the highways, particularly in Satyavedu and Varadaiahpalem mandals, which are connected to Chennai NH, close to the Sri City SEZ. The police have released posters with photographs of some of the gang members. The people have been told to immediately inform the police in case they find any suspicious elements moving in their areas. 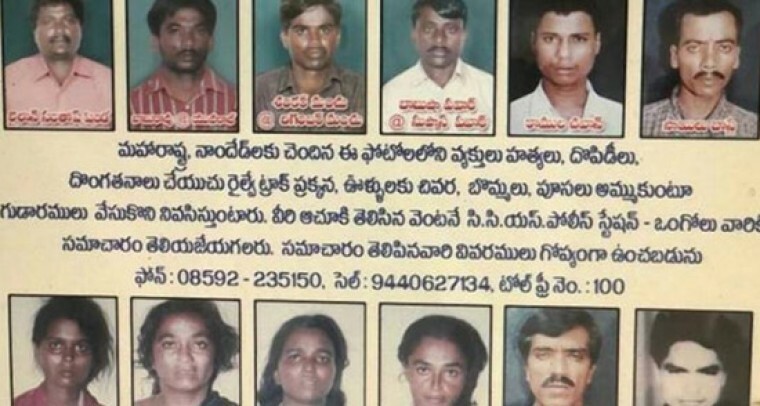 Records suggest that Chittoor district witnessed dreaded serial killings in 1997 and 1998, with 48 murders. Though all the murders were executed by two siblings — Gundla Gopal and Gundla Subramanyam from Pakala mandal — this led to a big fear among people. The duo were arrested with the help of fingerprints and were shot dead in an encounter when they tried to escape from police custody during a court trial.